Look at what I got!!! Don't be shock. This is not Burberry London but is a Burberry London Blue Label. Burberry blue is only available in Japan and it's very popular. I was lucky to get this nicely fitted classic checks design in a very reasonable price. 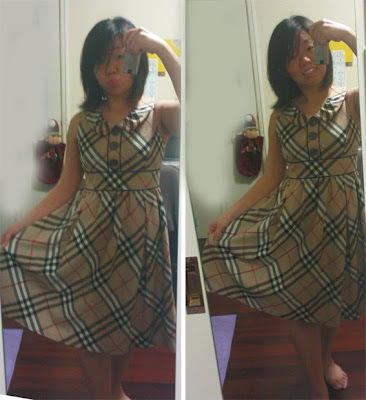 As a poor Burberry Lover, I am very happy with my purchase and for sure, NO REGRET! Where did I get this from since I'm in Australia and impossible to get it anywhere else except Japan? The answer is.. Bo Young found it for me from the Korea website. Korea got lotsa sites selling branded clothing. Too bad I can't read Korean, or else you will see me checking that korean site everyday looking for burberry stuff. kidding. hehe..
i know! mm seh tuk wear!